Here we have Reinforce II She is manufactured by ALTER and has a height of 190mm. 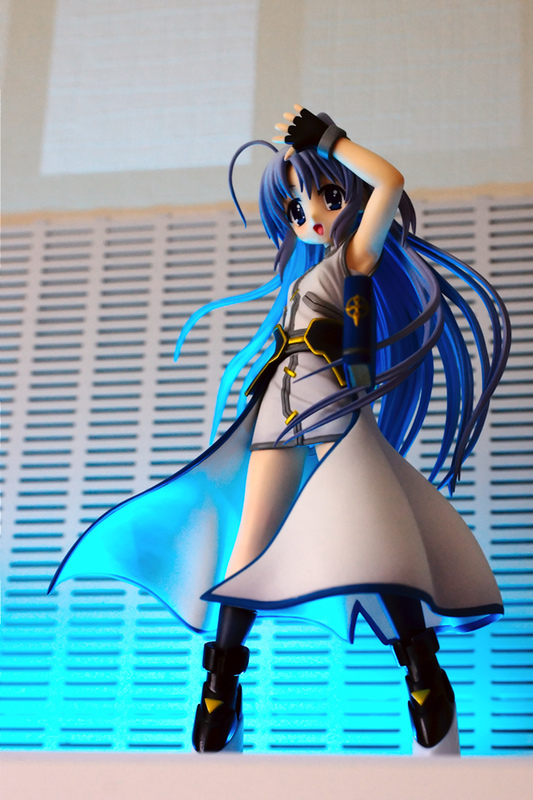 Reinforce is scaled 1/1 in the show Magical Girl Lyrical Nanoha StrikerS she was also around 190mm in height. I got a few months ago, she was sold to me on tsukiboard by porcelainepriss, thx again. 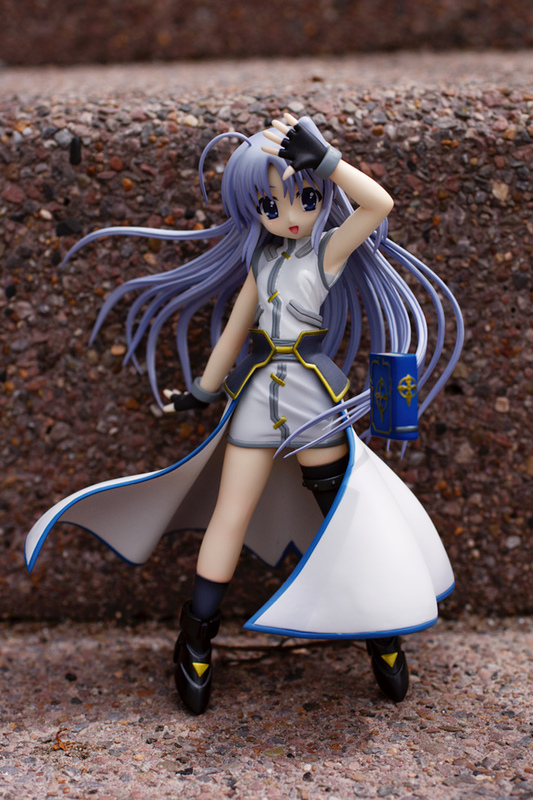 As mentioned before her origin is the anime show Magical Girl Lyrical Nanoha StrikerS. Some time went by since I watched this show, so I don’t have much knowledge about her role left. 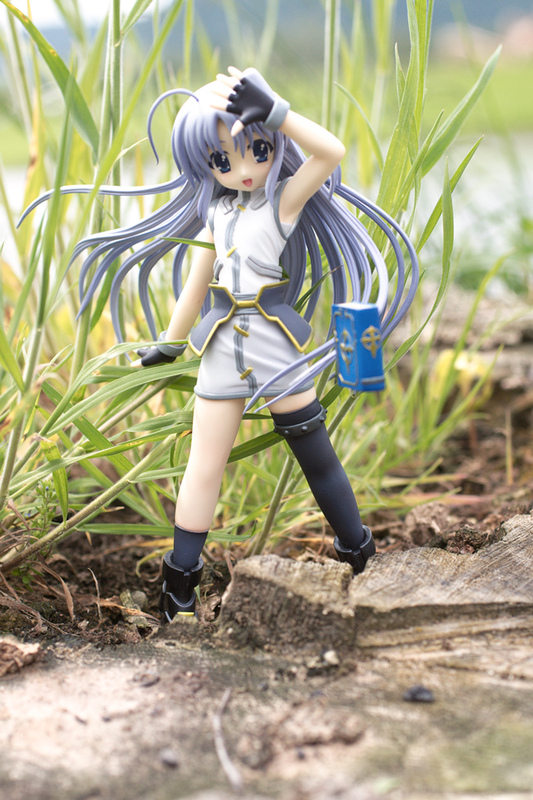 Reinforce II is a doll-sized version of Reinforce that has been accepted as a member of Hayate’s task force in the Time-Space Administration Bureau; she even wears the uniform. Reinforce II needs to eat and sleep daily; she lives in Hayate’s bag. 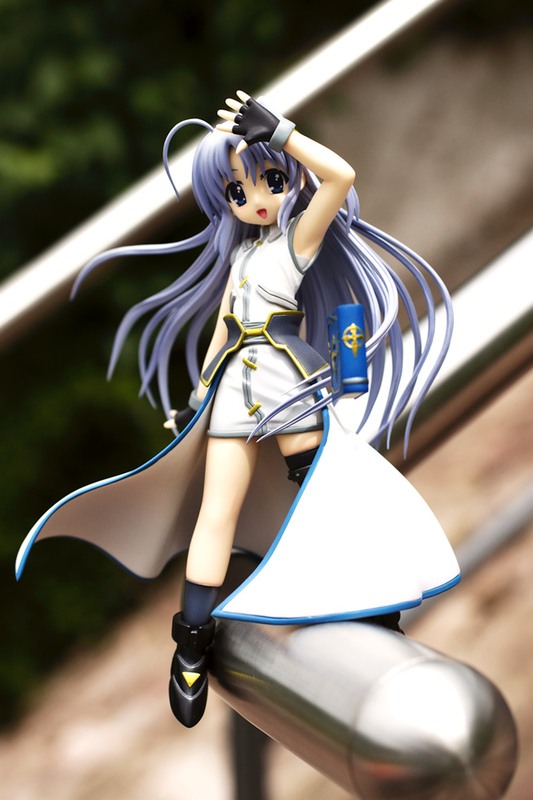 She holds the rank of Sergeant Major and serves as Hayate’s Chief of Staff in Lost Property Management Division 6. As to be expected from ALTER, Reinforce II resembles the look from her origin very well. 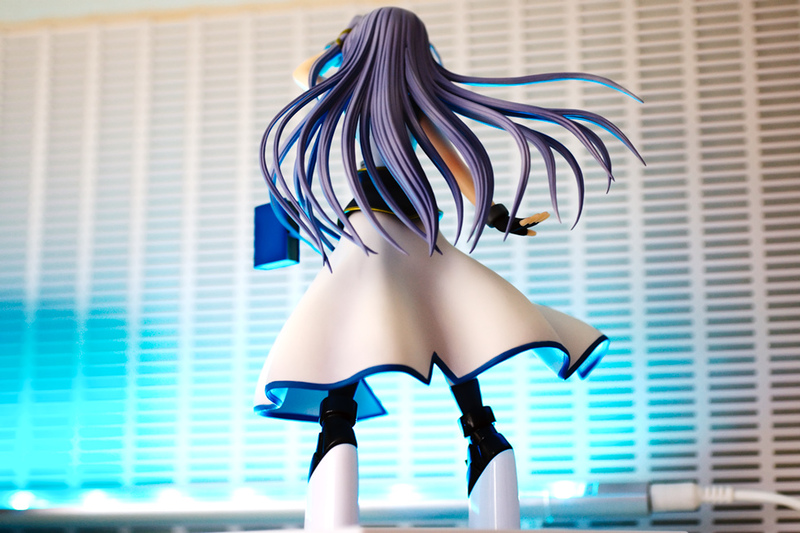 The pose is really nice the flow of the cape and her hair looks quite dynamic and cool. With her left arm in the air it looks like she wipes away the sweat from her forehead after a long and busy working day. Well you could also interpret it as a greeting pose. She wears her battle mode outfit. Her light grey clothes have nice details like the indicated zippers and bags. The flowing cape with the blue contour looks really cool. Her fingerless gloves add some fighting spirit to her mainly appearance. You can also take the cape off, you only have to divide the upper body from the lower body. 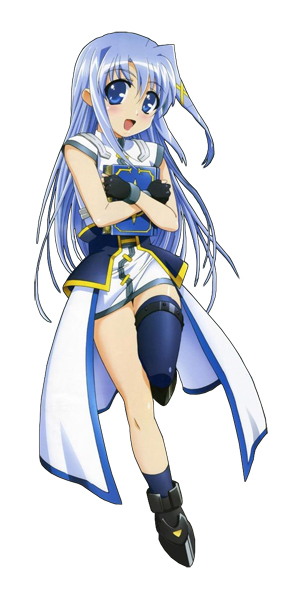 Then you have your Reinforce II in a miniskirt like outfit with that said I prefer her with the cape. 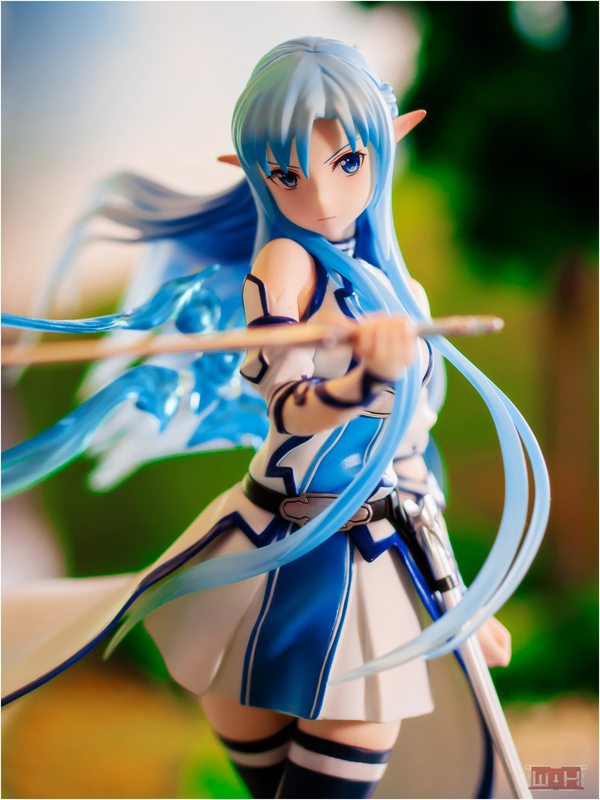 Her hair is sculpted very vivid and the fine detailed strands look really nice. The face has a cute expression with lightly painted blush marks, Reinforce II has big blue and detailed eyes. Im no real fan of figures with open mouth, but in case of Reinforce the expression suits her character. 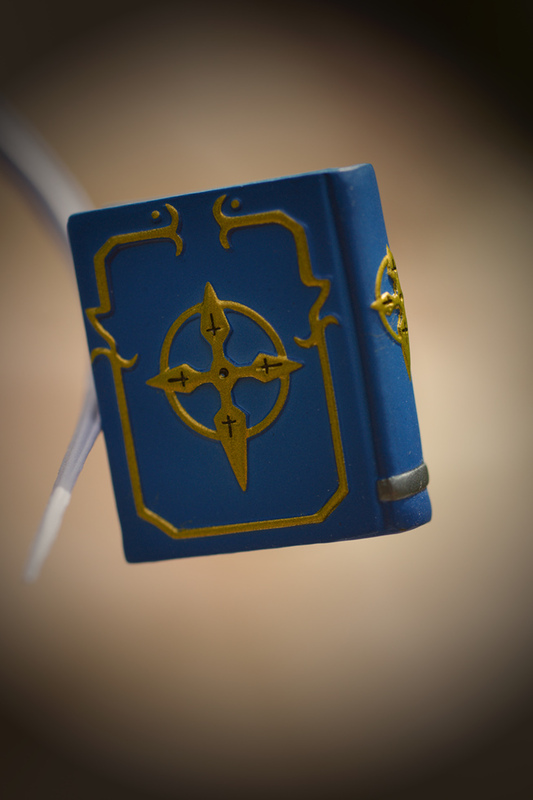 Another cool feature is the book which is attached to one of her hair strands, it has nice details and it really looks like it floats in the air. 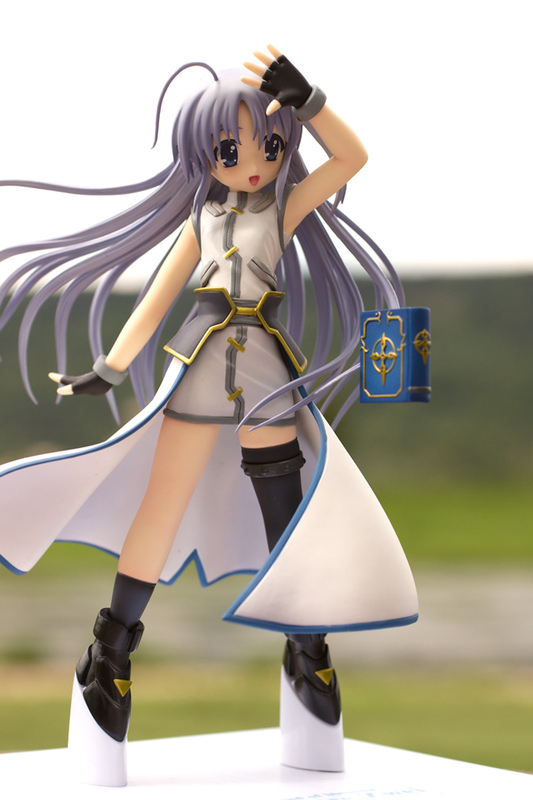 Overall its a great figure, her charm points are the very cute face as well as her dynamic pose with the flowing cape and hair. She has short legs from some angles they even look a bit stumpy. Her base is a white rectangle plate which looks very uninspired, but it fullfills it’s purpose. 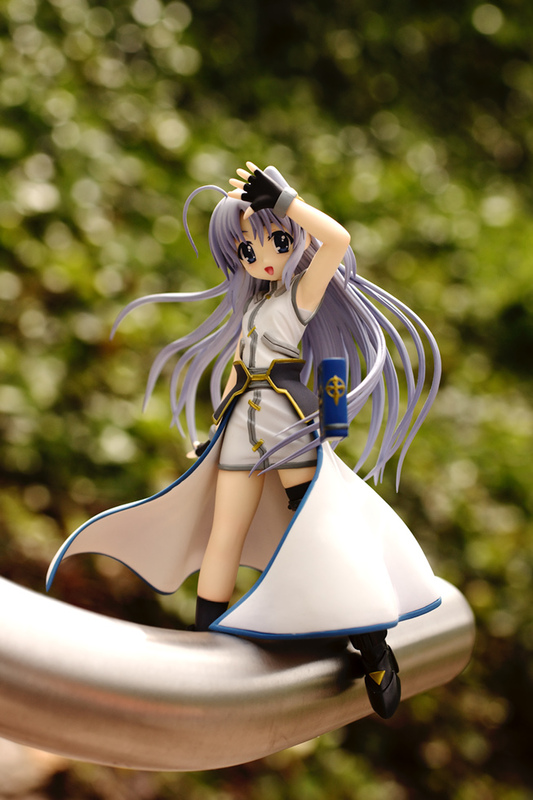 If you are more interested in this figure, here are two other good reviews of her. 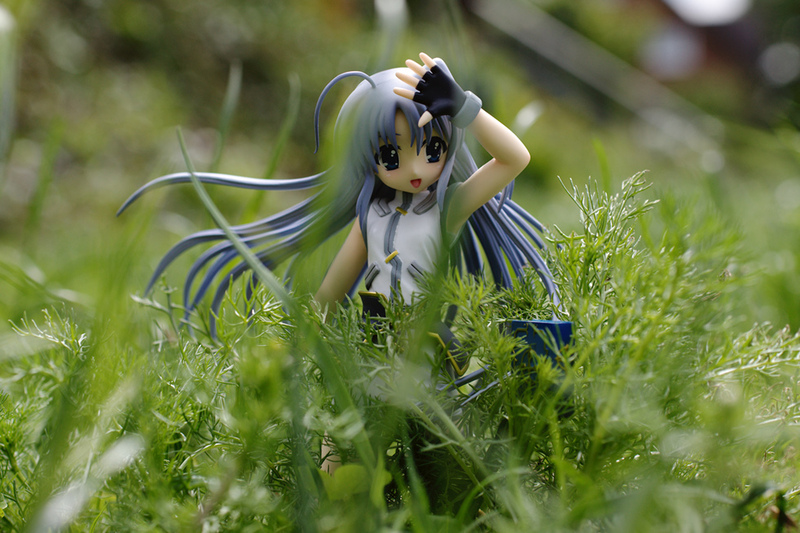 she was out in May 2008 I overlooked her,too because I wasn’t well informed about the figure market at that time. This is really impressive work from Alter. When was she out? Hmm… I didn’t notice her at all. 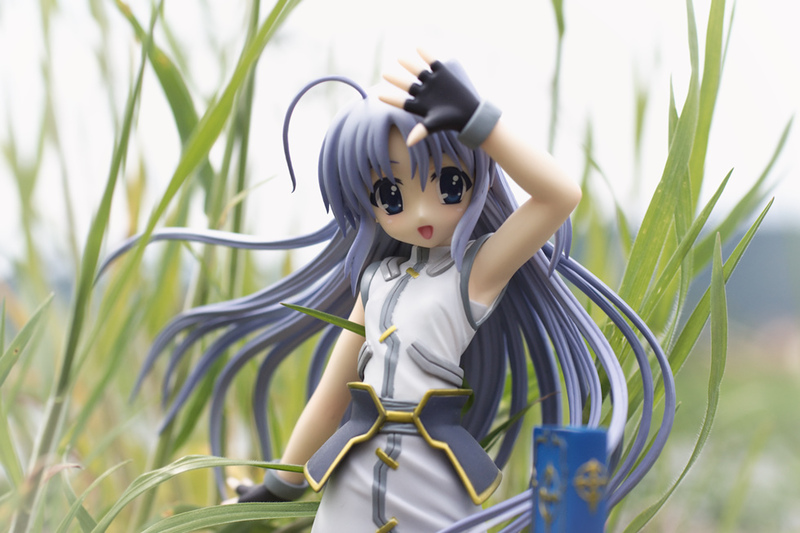 I like the way she raised her hands which make her very suitable for outdoor shots. The outdoor shots are very nice. Great work! 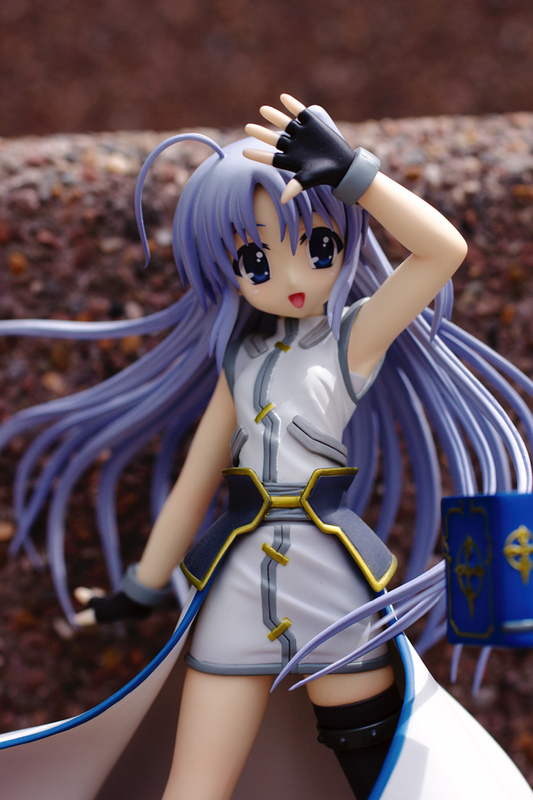 This figure is so epic that i bought 2 of her!! 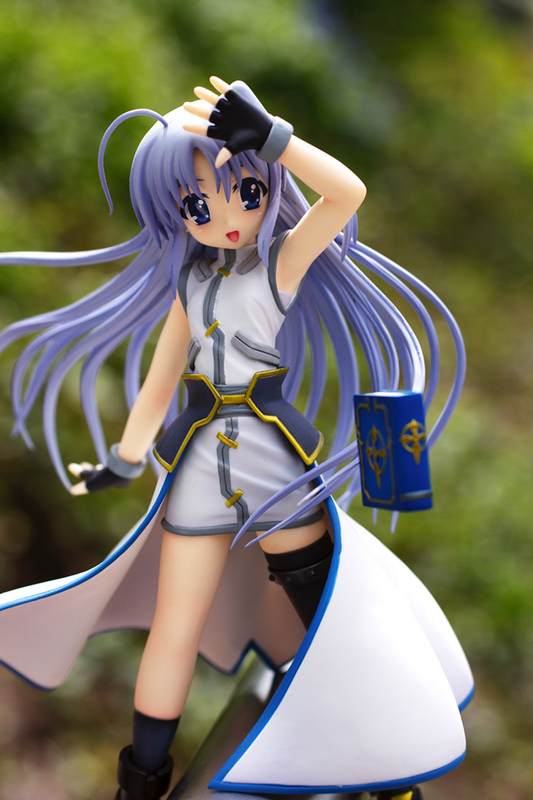 Intending to customize my own base after i secure the funds to do so… Together with the other Nanoha ALTER figures. Yes, Alter really made some quality work with the StrikerS figures. especially the Unison Version looks really good. 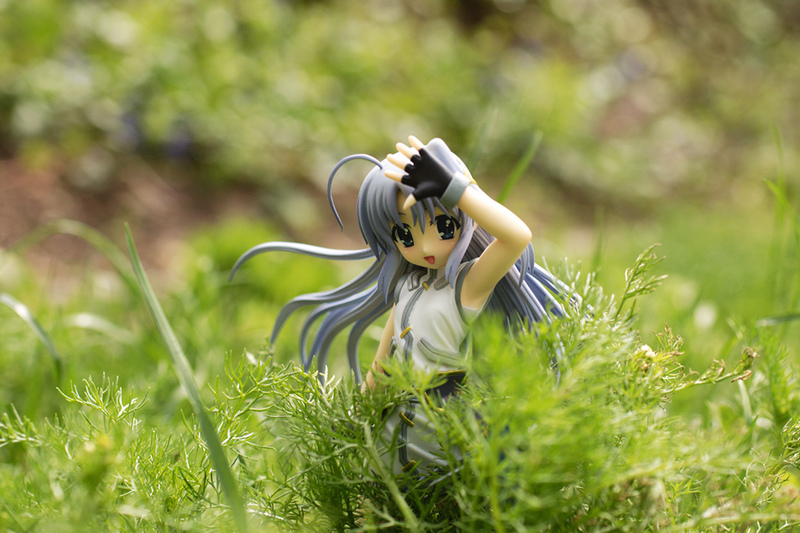 A cute figure and an 1/1! I think Alter done good work here too.